Water views from every room! This beautiful 2 bedroom, 2 bath beachfront villa has an updated kitchen with Corian counters as well as hardwood floors. 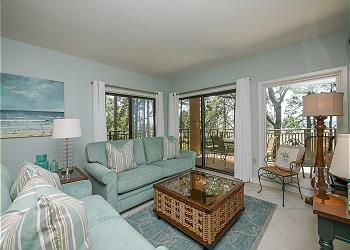 Located on the 1st floor this wonderful Sea Pines villa looks out over the pool to the water and Daufuskie Island. You can walk right out of the living room to your deck with a dining table and convenient access to the beautiful pool area. The main area of the villa encompasses an open kitchen with breakfast bar, dining area that seats 6, and living room with a large flat-screen TV. The master bedroom is furnished with king bedding and has a private en-suite bathroom. The Guest room has 2 Queen beds and has a private bath. The master and guest bedroom both have access to deck, perfect for enjoying your morning coffee.